Media crisis – Is the solution to shift from reporting what happened to what is going to happen? It’s a sign of the times, from The Times. The New York Times Sydney Ember published this article about the future of the news business. I have been giving this subject a great deal of thought over the years and am delighted to learn that they have invested in figuring out a plan. As I see it – the issue is that large volume news is all about targeting large audiences (to get large ad dollars) and to do that they need to produce information their readers didn’t know. Before the internet, and after the telephone, there was a long period of time where 24 hours was usually plenty of time to stay ahead of most readers in terms of what they didn’t already know. 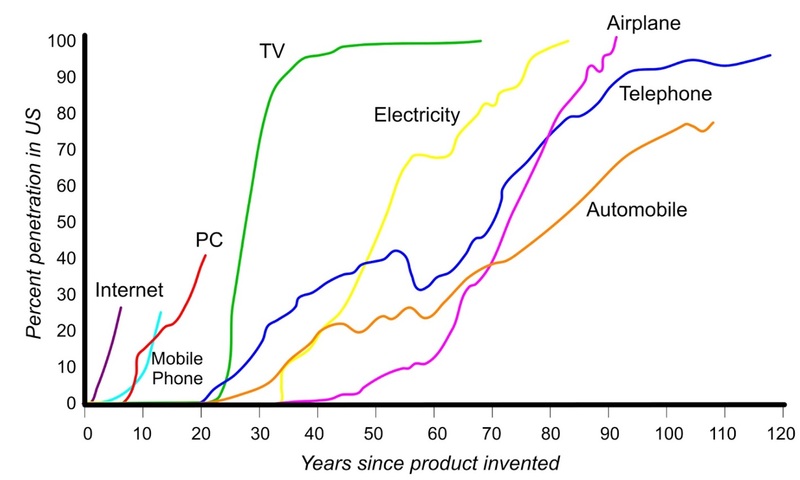 If the telephone was invented in 1849, and the above graph says it took 70 years for 50% of the population to have one, that takes us to about 1920. So then if you figure Internet adoption happened at around 2000, that’s an 80 year window of smooth sailing for media. But this isn’t just about the print version of The New York Times. This is about the ongoing role of the media. They can either go for a lower volume of people who still don’t know the news – and inform them, or they can continue to target the higher volumes and add details most of us have missed – either with more obscure facts (which risk having the mass appeal) or adding more opinions, which is a shift in their expected objectivity – but clearly places like Fox News and CNN have thrown objective reporting out the window. One frontier that is interesting is to move the timeline to focus less on what already happened, to more on what’s coming. There’s still a way the media can stay ahead of what information we are taking in – by telling us what’s coming, and what could happen. In a sense the media could all become more like weather people – meteorologists – saying here’s what’s probably going to happen today – and watch out for what’s coming later in the week. This isn’t limited to news and large audiences. The same applies to our LinkedIn, Facebook, and other, smaller circles of information sharing. I haven’t read all of Ember’s report yet – but I am looking forward to it and I am eager to hear what’s coming. Because I suspect that’s a big part of the future role of the media – to focus more on the future, than the past.